An interpretation centre in the town of Tadoussac in Quebec, Canada, adorns the waterfront and is full of fascinating discoveries. 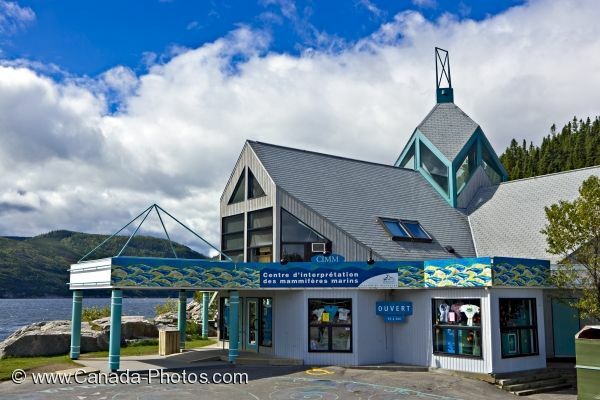 The Centre d'Interpretation des Mammiferes Marins or Interpretation Centre in the town of Tadoussac in Quebec, Canada sits along the shores of the Gulf of St. Lawrence. The Interpretation Centre is open from the middle of May until the middle of October every year. Here tourists can learn about the whales who visit the area and other species of marine mammals found around Tadoussac. A shop full of souvenirs is also open at the Interpretation Centre where visitors can browse and buy unique gifts. Centre d'Interpretation des Mammiferes Marins in the town of Tadoussac, Route des Baleines, Highway 138, Manicouagan, Gulf of St Lawrence, Quebec, Canada. Picture of the Interpretation Centre in the town of Tadoussac along the Gulf of St. Lawrence in Quebec, Canada.